When it comes to noodles and ramen, Chicago delivers. Here are six new spots to try. Joy Yee Plus Shabu Shabu Joy Yee Plus, the sushi, ramen and fro-yo spot that opened last fall and closed a few months later, is now Joy Yee Plus Shabu Shabu. 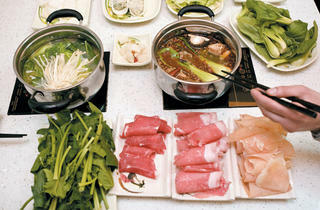 The sushi and the fro-yo are still intact (as are the fish tanks in the floors), but now the focus is on Chinese hot pot. For $16.50, the seafood hot pot is a stunner: rich shellfish broth with light tartness and good kick from togarashi, plus greens, gourd, shrimp-filled mushrooms, tofu triangles, raw snapper and salmon, clams, scallops, blue crab and a light ponzu for dipping. Meat eaters should tack on an order of the Wagyu. A heaping snarl of udon noodles crowned with a raw quail egg is intended to get dumped in last to wrap up the meal—a bonus considering you’ll want every last drop of the impressive broths. 2159 S China Pl (312-842-8928). El: Red to Cermak/Chinatown. Bus: 21, 24. Lunch, dinner. Average main course: $12. Santouka Yes, Noodles by Takashi in the State Street Macy’s makes it unnecessary to haul it out to Arlington Heights for good ramen. But if you’re hitting Mitsuwa for supplies anyway, don’t miss Santouka, where ramen is made just about any way you can imagine...as long as it’s traditional and involves pork. The gargantuan menu has three different sizes of multiple ramen types—the #33 Toroniku spicy miso ramen with “special pork” (a terribly tasty and tender pork cheek) comes DIY-style with the rich, salty broth and perfectly cooked noodles in one bowl and the meat, bamboo shoots and scallions on a separate plate. 100 E Algonquin Rd, Arlington Heights (847-357-0286). Lunch, dinner. Average main course: $11. Noodles by Takashi Good ramen is hard to find, especially in the Loop. And while we’re grateful for chef Takashi Yagahashi’s return to Chicago (after successful runs in Detroit and Vegas), we have to try hard to shrug off the $9 price tag for a bowl of noodles in broth. The best way to avoid buyer’s remorse is to go with a friend, split a bowl of the shio ramen (typical noodles boosted by a soy-miso broth, ground pork, baby bok choy, ground ginger and sesame seeds), and supplement with stellar starters like the steamed bun stuffed with glistening braised pork. Macy’s on State Street, 111 N State St, seventh floor (312-781-2955). El: Blue to Washington; Brown, Green, Orange, Pink, Purple (rush hrs) to Randolph. Bus: 3, 4, 14, 20, 26, 60, 145, 147, 148, 151. Lunch (Mon–Sat). Average main course: $8. Penny’s Noodle Shop Purists may scoff at the ho-hum offerings, but this longtime favorite continues to pack in big crowds who seem to prefer their pad si-ewe come a little more—how to put this kindly?—Anglofied than authentic. You’ll find perfectly fine versions of standard noodle and rice dishes like lad nar (crispy wide noodles sauteed with veggies and topped with gravy) and Chinese fried rice. And if you (or your significant other) is a vegetarian, you’ll do particularly well, with choices such as the inspired watercress with garlic bean sauce; chilled steamed broccoli with Dijon-soy dressing; and stir-fried tofu with bean sprouts. 3400 N Sheffield Ave (773-281-8222). El: Red, Brown, Purple (rush hrs) to Belmont. Bus: 22, 77. Lunch, dinner (closed Mon). Average main course: $7. •Other locations: 1542 N Damen Ave, 773-394-0100; 950 W Diversey Pkwy, 773-281-8448. Tao Ran Ju It’s easy to get distracted by the excellent xiao long bao (soup dumplings) and gratis snacks like blistered peanuts with shimmery slivers of dried fish. 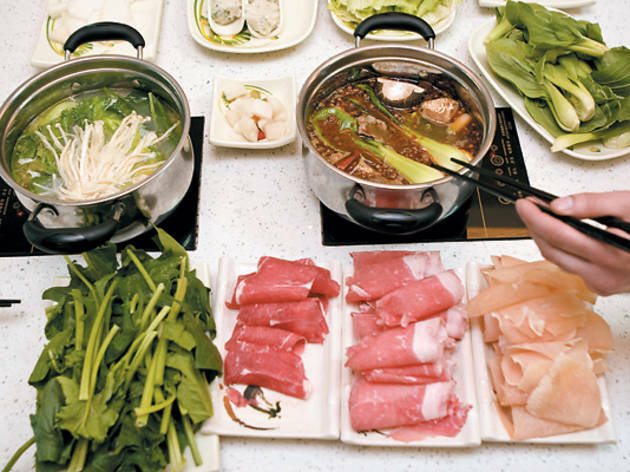 But the slick, modern tables outfitted with individual heating elements are a reminder that hot pots, or huo guo, are the star of this restaurant’s show. First, pick a broth (the sour and spicy is amazing). Next, order a good mix of vegetables, the razor-thin beef, the shell-on shrimp, an order of housemade rice noodles and the fish tofu. Finally, take a stroll to the condiment bar, where the sha cha—labeled as “satay sauce”—is the condiment not to miss. 2002 S Wentworth Ave (312-808-1111). El: Red to Cermak/Chinatown. Bus: 21, 29, 62. Lunch, dinner. Average main course: $9. Urbanbelly You’d think a dish called the “Urbanbelly ramen” would be this noodle bar’s signature item. But as satisfying and delicious as that bowl of clove-kissed broth and pork belly is, the best noodle dish here is the rice-cake noodles. The chewy, mini-Frisbee-shaped noodles are topped with a juicy, perfectly fried chicken breast and bits of mango, which help cool the fiery, chile-spiked broth. Like the rich lamb-and-brandy dumplings, it’s the kind of dish you’ll want to take your time with. But the crowds that hover over you, waiting for you to vacate your seat, demand that you eat your food fast and jet. So savor the food quickly, or get it to go. 3053 N California Ave (773-583-0500). El: Blue to Belmont. Bus: 52, 77, 82. Lunch, dinner (closed Mon). Average main course: $12.